There is always an issue about what to do with kit when the team changes sponsor or logo and the FAW have come up with an innovative scheme – get the kit to school kids in Africa who love their football with a passion that matches even the Welsh fervour! Through a UK charity, The Akili Trust, the FAW recently donated two full kits to two schools in the poorest areas in the Coast region of Kenya. Akili sets up and runs libraries in rural Kenya and also provides bursaries for bright students to get a secondary education (something that is still prohibitively expensive for many in Kenya). The two recipients chosen by local people as being deserving of such a gift were Canon Mweri Memorial Secondary School in Watamu and Kakuyuni Primary School near Malindi. 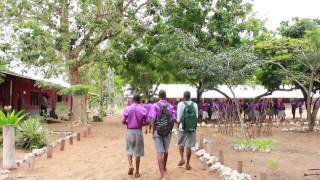 Canon Mweri, run by Principal Dennis Mackenzie, is a small secondary school of only 214 children that was started in 2004 by local parents who needed a school to cater for children who lived in villages and could not get to town. Its good results academically have already given it district and national rankings, Canon Mweri was re-categorised as a state school in 2008 and looks after boys and girls between the ages of 15 – 18 years old. The Trust will be opening a new library there later this year in partnership with the school. The school football team plays regularly in tournaments with other schools but until now had no kit whatsoever. They were over the moon to receive the Welsh kit – in fact, such was their pride on hearing about the donation that they have promptly named the team the Canon Mweri Dragons! The football coach, Charles Oluande, and the whole school looked on proudly as the Canon Mweri Dragons lined up in their new colours, eager for their first match. The second school, Kakuyuni, is a large primary school with over 1,000 children up to the ages of about 15 years old. The school is run by Head Teacher, Raymond Charo, who is new to the post and has taken on the challenge of running a school in an area where many children get no food at all during school hours and only 20% of children will go on to secondary education. Nevertheless he, with his football coach, Thoya Sampson, recognise the importance for children of physical education and the team is one that has a very good record in the district, albeit one that until now had no kit. The Kakuyuni football team feels that they are now in a strong position to win even more games and here they show their delight in a match arranged solely to test the new kit. The Welsh flag is now also proudly pinned up in the classroom reinforce their newly established Welsh links. Lucy Evans, Treasurer for the Akili Trust, who took the kits to the schools said “you could not have provided a better gift for African children – the excitement when they saw that they would have real football jerseys was extraordinary and there are now two communities in Kenya who will also follow Wales and support the team from so far away”. We are delighted that the Trust has been able to arrange for the libraries in these schools to receive subscriptions to both Match and Four Four Two thanks to the generosity of their publishers.